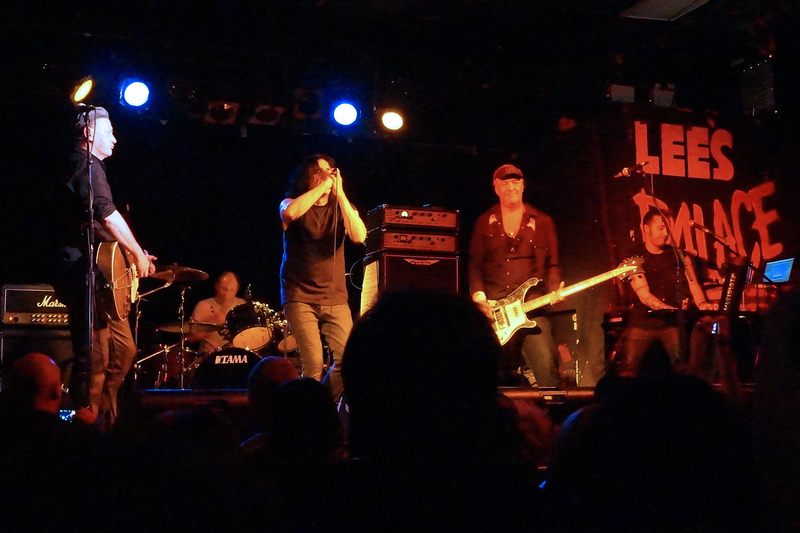 Few acts retain the punching power of their earliest days, but Killing Joke‘s luminescent fury has worn especially well through three decades of near-constant service (and about seven rhythm sections). That 2010 occasioned the first tour by the founding quartet in 28 years was reason enough to pack earplugs and book a babysitter. Because these guys can pound it. 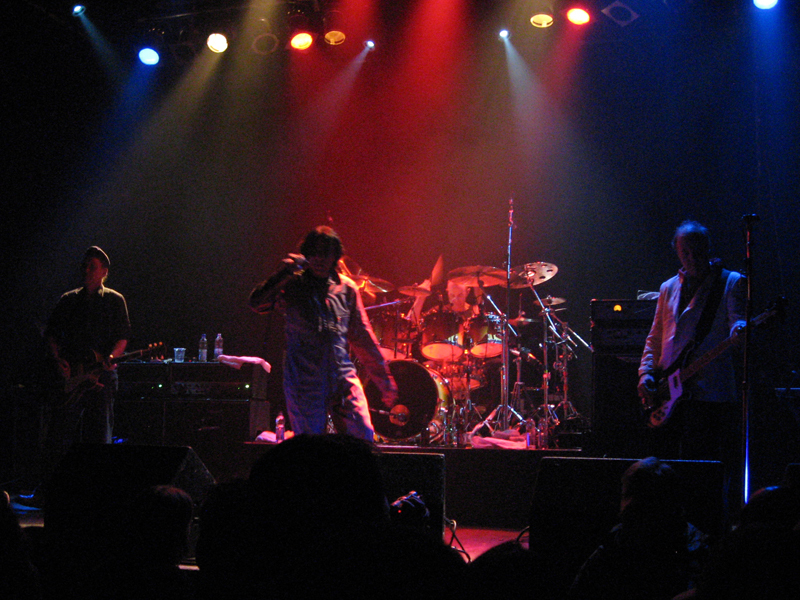 Toronto’s Phoenix Concert Theatre bore witness Tuesday night (December 7, 2010). Considering the Pavlovian response to the promise of a date with the founding fathers of any noteworthy band, it’s no surprise the crowd was baying in the tear-down time between the local opener, Lioness, and the imminent appearance of the Joke. The fiftysomething guy in front of me sure as hell came prepared. Timing whatever he was ingesting for maximum efficiency, he tripped out early, and laid into several people before security wearied of the inevitable cause-effect and hauled him out of the club. Joke’s on you. Blessed though Killing Joke may be with a catalog of consistent quality, the set observed the hourglass model of the veteran band on a non-nostalgia trip: lots of new songs, lots of very old songs, and little in between. All but four hailed from either the first two LPs or the newest (2010’s very good Absolute Dissent), smart arithmetic made even more appealing by the inclusion of the twin towers from Killing Joke’s brief mid-’80s pop chart phase. It would’ve been understandable if “Love Like Blood” and “Eighties” were passed over in deference to bassist Youth‘s non-involvement with the recorded versions, but singer Jaz Coleman had purpose in mind. After the strident “Tomorrow’s World” unsealed the casket, he effectively ripped it open in homage to former bassist Paul Raven, referencing his 2007 death and his place in Joke lore. 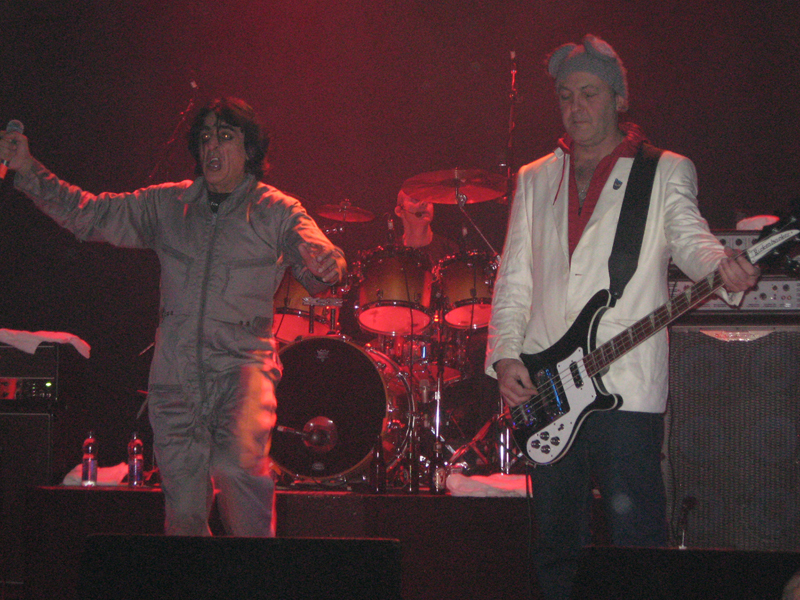 “Love Like Blood” may seem contrary to Killing Joke’s oft-noted hardness, but it’s more a case of ingredients rearranged: insistent drums, subtle keyboards underpinning melodies played out on shattering, staccato guitar chords, a throbbing bass pulse anchoring the engine, a declamatory vocal delivered at peak volume. But because “Love Like Blood” got significant radio play here and made the top 20 in the U.K., it’s a signature piece for much of the audience, and tonight, fired by the common knowledge that Raven’s death begat the current new/old Killing Joke, it was celebratory. Its do-it-early-and-do-it-right excellence put the room in a great mood, and that carried the band for the rest of the night. With an auxiliary player handling Coleman’s keyboard parts, the singer stayed centre-stage, hulking about in one of Pete Townshend’s old boilersuits, clenching his fists and raccoon-mascara’d eyes with equal intensity. 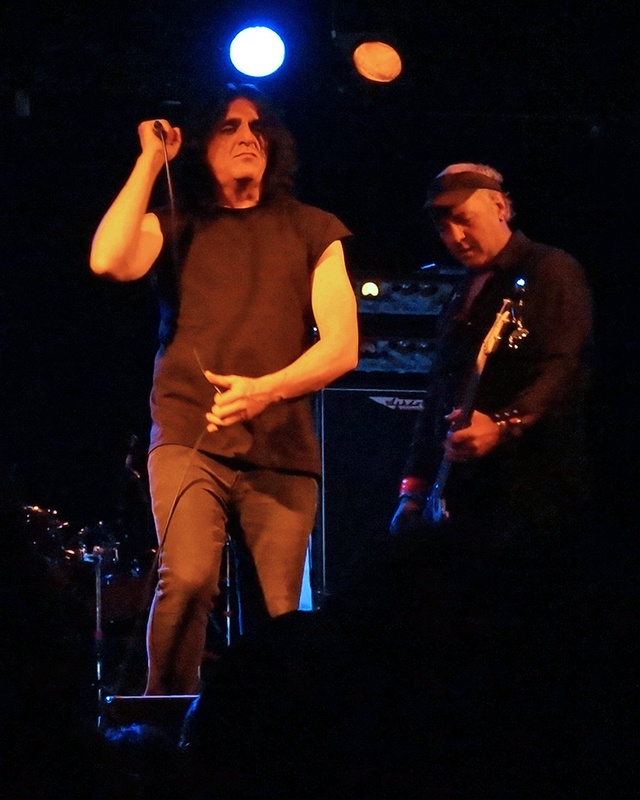 The rest of Killing Joke is essentially a nimble death-disco power trio. As such, their influence is manifest, and now-standard blog-reference standbys “Wardance,” “Change” and “The Wait” were faithfully reproduced. The band shuttled easily between the starker, sparer vintage material and the pushier, fuller, modern fare. Absolute Dissent‘s laudable variety touches on nearly aspect of the Joke’s career, and tonight’s picks brought metal, dub and darkwave to the party. Drummer Paul Ferguson‘s showcase album, 1981’s What’s This For…, was represented by “This Is Madness” and “The Fall Of Because,” lumbering, jackhammer songs punctuated by angry shouts from all four members and some of guitarist Geordie Walker‘s most unhinged playing. At the heart of the cacophony, Walker never broke a sweat. 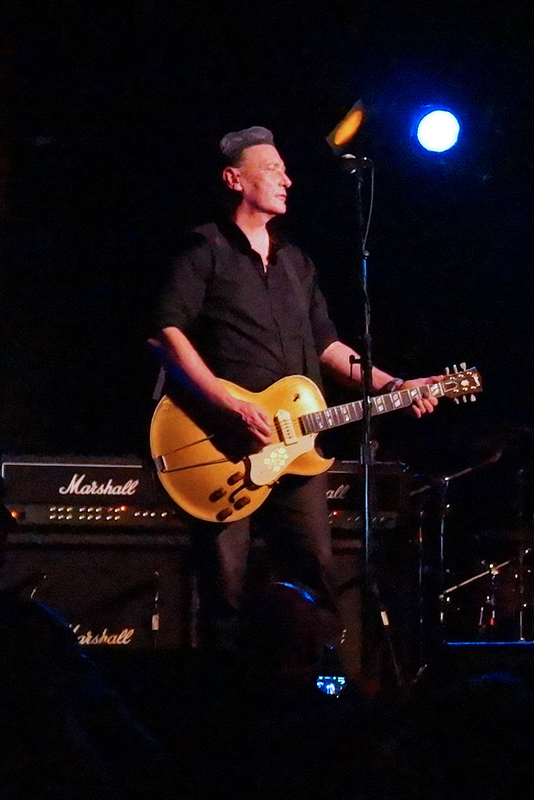 Floating about the stage like a wraith, his lead hand never progressing past a stylized strum, he coaxed witheringly hot sounds from the same ’50s-vintage, hollow-bodied Gibson ES-295 he’s used since the band’s first days. Killing Joke’s thundering melodic mass occasionally turned the PA to jelly, and The Phoenix groaned a few times under the full-court attack. Expectations met, the crowd roared its approval. And the band played on.